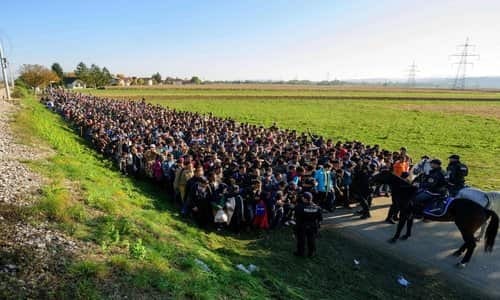 Senior Iranian and Turkish officials have explicitly threatened to overwhelm Europe with new waves of Middle Eastern refugees if their demands aren't met. To these Islamist republics, Muslim refugees are weapons of jihad, not victims. Iranian officials are also implying that they will build nuclear weapons or at least approach nuclear "break-out" capability as quickly as possible if the nuclear deal ends. In other words, the Islamist government of Turkey -- a NATO "ally" -- is claiming it holds the fate of Germany's elected politicians in its hands. It is also possible that the Turkish government could try to kill two birds with one stone by provoking a Kurdish refugee crisis that destabilizes Europe while at the same time shifts Turkey's demographics in a direction more favorable to the Islamists. About 18 to 20 percent of the Turkish population is Kurdish and its proportion is growing due to higher birth rates. That means that Erdogan's Islamist constituency is growing weaker day by day, even without taking into account the growing angst of non-Islamist, non-Kurdish Turks. Senior Iranian officials are likewise threatening to escalate the refugee crisis in Europe if the U.S. leaves the nuclear deal. Officials have also warned that in this case, Iran will "follow North Korea," the closest the regime has come to openly saying they will build nuclear weapons. He said the price the West would have to pay if the nuclear deal ends is "crystal clear": "Just a wave of refugees could throw them into a state of disarray." Notice the word "just" in the translation. The Iranian official isn't just mentioning a form of retaliation. He is expressing his belief that the West, especially Europe, is fragile and at risk of crumbling with a simple shove. He sees Europe as essentially a "paper tiger," as Mao Ze-Dong used to say of the U.S. He did not exactly state how the end of the nuclear deal would result in a new refugee crisis, yet it is in the regime's morbid interests to use sectarian violence to shift the demographics of Syria, Iraq, Lebanon, Afghanistan, Yemen and even Bahrain and Saudi Arabia's Eastern Province. "Look! Their achievement was not to prevent us from acquiring the Iranian nuclear bomb 'in their point of view,' but was to procrastinate [delay] that only for one year as they'd call 'break-out time.'" What he means is that the West's goal was to stop Iran from achieving "nuclear break-out capability," the point at which all the assets are available for an imminent development of a nuclear bomb. He correctly states that the Obama Administration and its European partners wanted the deal to keep Iran at least one year away from "breakout" capability, so that there is potentially enough time for the West to detect and responded to an Iranian dash towards nukes. Araghchi has been in Iran's foreign ministry in some capacity since 1989, so his words should be taken very seriously. He is no "rogue" official who went "off-message," as the regime propagandists may try to frame it. Of course, Iran always intended to obtain a nuclear arsenal. As far back as 2010, I theorized that Iran's "script to get the bomb" included finding a pretext with which to justify the construction of a nuclear arsenal (i.e., an Israeli airstrike on its nuclear sites). It's very possible that the regime always intended for the nuclear deal to be cancelled, preferably in a way that enables it to blame the U.S. for "forcing" it to leave the Nuclear Non-Proliferation Treaty and build nukes.